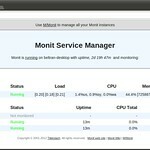 Monit is an open-source server monitoring and watchdog system for Linux and Unix. It allows system admins to custom-define various error conditions on server resources, such as missing processes, unexpected filesystem changes, memory/disk deficit and CPU overload. Upon any error situation being detected, Monit can perform user-defined actions such as restarting a problematic service, sending email notifications, logging to syslog, or invoking an external script/program. Monit comes with an integrated HTTP/HTTPS web server allowing web-based monitoring interface.